Is BETWEEN faster than GTE and LTE? I know I have been light on blog posting this year. They always say that life tends to get in the way of these sorts of tasks, and this year that is certainly true. Anyways, I want this blog to be more than just SQL Server virtualization with VMware vSphere, so I’m intending to branch out – not just with more hypervisors (Microsoft Hyper-V 2012 tips and tricks coming soon!) but want some more fun tidbits about core SQL Server as well. What a great question! Let’s experiment and see what conclusions we can draw. I’ll test with date ranges. First, let’s create a container to test with. Pick any throw-away database and let’s get started! Now, we’ll prime the table with some random date values. This script was adapted from a script from Ben Nadel. --prime table with random date values. -- here for the demo, but this could be done anyway you like. -- the month of october, 2006. OK. Run the block a few times to get a good number of rows in your test table. For the numbers below, I am running these on my home lab with SQL Server 2008R2 and 736,000 records in this table. I'll just pluck some random dates out of thin air and off we go. We see some interesting results. Table 'BTW'. Scan count 1, logical reads 1252, physical reads 0, read-ahead reads 0, lob logical reads 0, lob physical reads 0, lob read-ahead reads 0. CPU time = 47 ms, elapsed time = 1483 ms.
CPU time = 47 ms, elapsed time = 1964 ms. I have identical output here for each query. I ran this twenty times and got relatively the same results each time. 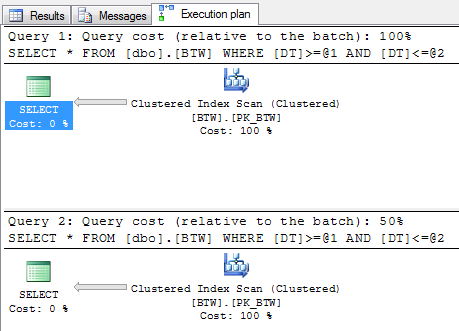 The query execution plans are identical as well. Hover over the Clustered Index Scan for each query. They are identical. It even converted the between to GTE and LTE for you. Sweet. Even more strange. The runtimes stayed with the locations and not the queries. It just gives us some proof that these really are equivalent. Maybe we should create an index on the column we're filtering on? Let's try it. --add a nonclustered index on DT column. --lots of room for inserts, as this is random data. Did it make a difference in the queries? Nope. The only thing that changed was the number of logical reads. Run them in reverse or forward order and these came out all over the place. Table 'BTW'. Scan count 1, logical reads 663, physical reads 0, read-ahead reads 0, lob logical reads 0, lob physical reads 0, lob read-ahead reads 0. CPU time = 32 ms, elapsed time = 800 ms.
CPU time = 47 ms, elapsed time = 1922 ms.
Now, notice something with the above screenshot of the execution plan. We've got implicit conversions on the date! Ack! If you ever see those in your query execution plans, figure out what's going on and fix it. It's extra overhead and might not always work the way you expect. Jes Borland has a great writeup on how to detect and correct implicit type conversions. It's a great read! I also tinkered around by putting a delay in between the two queries in an attempt to separate them a bit more. --implicit type conversions in the queries above? fix them! That fixed the differences in runtimes. 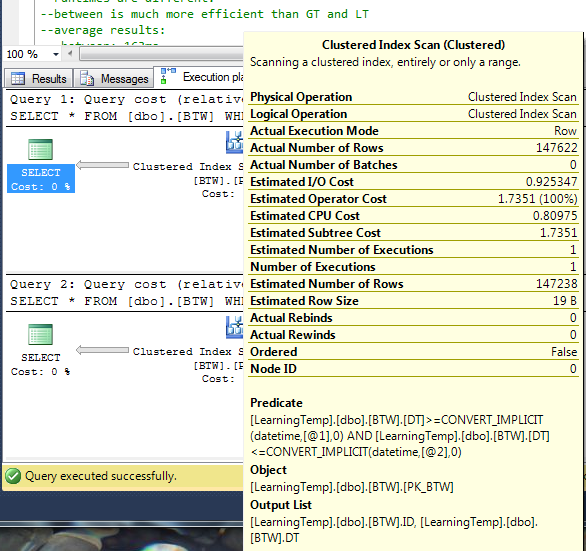 Now these are spaced out and the queries are executing almost identically. CPU time = 47 ms, elapsed time = 1280 ms.
CPU time = 0 ms, elapsed time = 5001 ms.
CPU time = 16 ms, elapsed time = 1127 ms.
Now, are these results conclusive to where I can objectively state that one is faster than the other? Of course not. Between is just shorthand for GTE and LTE anyways. Between looks to be translated to GTE and LTE during query compilation, and the execution plan reflects GTE and LTE. The execution times should be the same, give or take background noise on the server. Oops. You might be filtering out a day's worth of data! 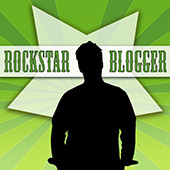 Aaron Bertrand has a great write-up on this topic at his blog here. 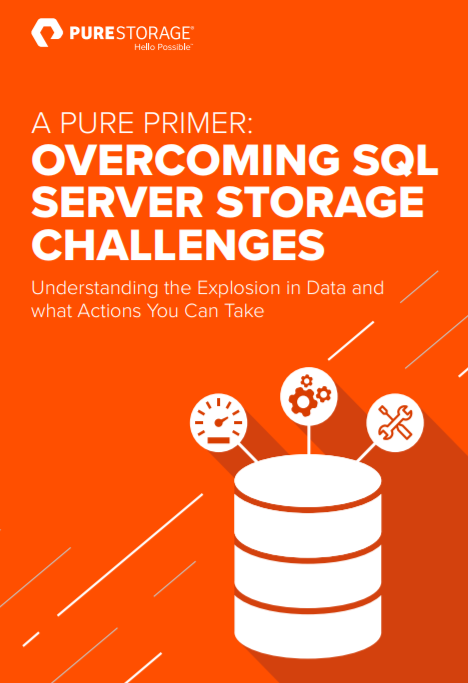 It's well worth the read if you do any sort of database development at all!